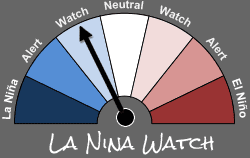 WUWT deniers "believe" this (maybe) La Nina means their much anticipated ice age is finally coming. No more global warming - ha! That's weird to the point of insanity. It's hard to imagine how any La Niña could possibly put an end to the long term rise in global surface temperatures, much less reverse it. And this one, if it happens, is likely to be weak and short-lived. 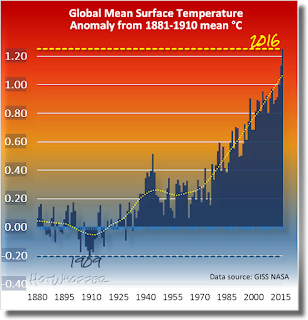 Annual global mean surface temperature. Anomaly from the 1881-1910 mean. Data source: GISS NASA. However they will lay low for a few years and then they will dust off all the academic papers from the 70’s and declare shamelessly that the coming Ice age is all because of man burning fossil fuel and they have determined sans polling that they have a 97% consensus which has been thoroughly peer reviewed and anyone who disagrees with them is a science denier and call for a Government inquisition. Second verse same as the first. mini ice age coming soon to a neighborhood near you. IMO growing Arctic sea ice will help end the AGW madness. Gore always asks what else could be causing the decline. If there is no more decline, one of the most visible examples of putative GHE is gone. There’s plenty of evidence for an approximately 60 year cyclicality. Fudged records don’t change the reality that the 30’s were probably just as hot as the 1985-95 period. We have had 18 years of no warming. Arctic ice is growing, it is cooling and will continue to do so. Arctic ice conditions control the lag that causes this cyclicality. First off, Oceans do NOT rule the temperature of this planet. The Sun does and oceans can only moderate to some degree what the Sun does. The Maunder Minimum is back, which is a completely cyclic event. Add to that the Saturn & Jupiter are on the same side of the the Solar System (not the norm) and that is pulling earth further out away from the cooling sun. We are going into a mini Ice Age. The Russians think that this could last for several hundred years. And it if you have not been paying attention to the BS our of the Controlled Science, that cooling has already started … with significant crop losses last year in the US, which will only increase rather quickly in the coming years. Made made Global Warming is a Hoax put out for idiots by criminals (Gore included). Look back at the art of the1600s and you’ll notice how heavily everyone dressed to stay warm and all the days were rather dark/cloudy/cold. Get ready. That time is coming again. Ramifications? Less food globally and that means far few people can be supported, i.e. billions. Best to be at/near or below 30 degrees. In the US, that is only 2 states. AndyG55 says it's now as cold as it was in the Little Ice Age. Is he nuts? It is cooler than all but a short period during the Little Ice Age. and the period 1950-1980. There is NO CO2 warming signature in the satellite temperature data. There is NO COI2 warming signature in sea level rise. There is NO CO2 warming signature ANYWHERE. !! Just a SLIGHT natural solar and ocean based warming from the COLDEST period in the last 10,000 years. Any ocean cooling currently being experienced is due to vast melt off at the poles which is also due in part to solar/earth dynamics and the fact that earth’s orbit has changed enough since 2004 to expose far greater swaths of the planet to high incidence angle sunlight. Volcanic activity, especially oceanic, has markedly increased due to the increase in crustal stress from orbital changes. What is occurring in the Antarctic alone is truly remarkable. The moon, ever the handy dynamic lever that it is, now moves through dozens of degrees of latitude per MONTH rather than the former total of 10deg per YEAR. Many quakes are easily predictable by simply observing the moon’s orbital changes. Also, they don’t aerosolize the atmosphere the world over just for giggles. It is largely to mitigate increased solar radiation. The sun now rises and sets over canada in summer, far north of 23.5deg north at the tropic of cancer that runs through central mexico. Gary Pearse can't distinguish between weather and climate, and says he's been predicting a major cooling. He'll show those know-nothings who actually study climate. He also thinks this possible La Nina will be the basis for a PhD thesis. Who knows? Anthony, I was remarking on low volume of warm water in the equatorial Pacific despite temperatures being warm prior to the development of the El Nino on some of the last threads here by Bob Tisdale when the El Nino was having a long doubtful zig zag development. I was surprised (and suspicious) of the peak it reached, but not surprised when it just dropped like a rock. I noted also, the stubborn hot blobs in the temperate/north Pacific suddenly turned to cold Blobs and rather than simple upwelling in the eastern equatorial, the growing cold Blobs in both the NH and SH were slanting down to the equator feeding the ENSO band. Accordingly, I predicted a major cooling and have repeated this over the months here. It’s surprising to me that climate scientists haven’t picked up on this (Gavin still blaring about warming). I also predict it will become someone’s PhD thesis over the next year or so. La Niña develops because surface water, which is warm, gets wind-blown shoved westward and then mixed in elsewhere as it rides the choppy surface and undercurrents. El Niño develops because winds change that allows the surface water, which is warm, to relax back across the surface and layer up with warm water on the top. So, heating up or cooling down can be just the allusionary outcome of different mixing conditions while total global ocean heat remains balanced. However, the ice cores tell us that there are long term severe swings. That said, there is no way to measure balance or imbalance, yet, in incremental total increase or decrease in ocean heat content. Plus, no one lives long enough, nor their stored data to know what slope they are on. The next ice age will remove all our stored data and we will eventually repeat the unknowing scare that the world is ending because it is too cold or too hot and we are to blame. If there is one thing we can count on it is this: humans never learn. They still make ludicrous decisions based on their limited knowledge that only extends to the end of their noses. It is just that their implements change that support their notions. PS I don't think I can get back to blogging full time for a little while yet. I'll try not to be away for too much longer though. Definitely outside the norm for people I know socially and those I've worked with, studied with and interacted with on any level outside cyberspace. Oh! A HotWhopper article popped up in my feed. What a pleasant surprise. Clutz also called 'global cooling' in a recent WUWT thread comment because, wait for it, sea surface temperatures have cooled since the big El Nino of 2015/16! I'm sure many of those who've joked about this since last year also knew that climate change deniers have been reduced to the point that some would be saying this in all seriousness. That barrel is down to the bottom of the last bitter, stupidest dregs. Unfortunately, the last stupidest dregs are running the show in Washington, DC. And what a show government by climate change deniers is with its use of "alternative facts" on a daily basis. And CO2 jumped up by another record margin. Can't see any jokes here. El Nino? Deniers only know what El Nino is when it is an El Nino year. Shouldn't somebody point the ice age comethers to Monckton's Cool Futures hedge fund so they can invest their money according to their claimed beliefs? "The sun now rises and sets over canada in summer, far north of 23.5deg north at the tropic of cancer that runs through central mexico." It's true -- when I was a blastomere in Canada it was dark all the time, but over time we started getting some sun in summer and now there's days when it's light even at midnight. It's been cooling over that period though. Initially it was about 37 degrees all the time, but now I have to contend with temperatures well below freezing. I predict rapid hemispheric scale cooling over the next 3 months! The Maunder Minimum is back, which is a completely cyclic event. Uh, the Maunder Minimum was a single, specific event. It is not a type of event. This is like saying "The 1966 World Cup is back, which is a completely cyclic event." In any case, I'd like to see his evidence for a predictable cycle of Maunder-like events. Not to mention his evidence that a Maunder-like event is about to begin. Your last tweet is near perfection, it only needs a hashtag #LetsMakeItaContest to make it purrfect. Your only response to the article (which has a graph clearly showing actual data on declining sea surface temperatures) is to say that a _prediction_ by one office is more important than actual data. Oh now I realize why: You (and many climate scientists) prefer predictions over data. Global warming data can be inconvenient at times! Actually, no. The HotWhopper article was mocking WUWT and deniers in general for their latest, and quite predictable, meme: "it hasn't warmed since 2016". Tom, straw men arguments/insults are boring. And you also seem to be ignoring Ron Clutz's own "prediction". Sou's point is the time interval of the data is too short to indicate a trend. So for someone to use it to claim SSTs are declining is disingenuous. "Your only response to the article ..."
Only response? No it is not. Did you read the article? It is a bit difficult to have data about the future. Though of course we do not have the advantage of a time machine like at WUWT. Though it is a puzzle why the data they bring back always turns out to be wrong. Where do they get their data from? Oh ..., of course. And mind you the analysis of the "data" at WUWT seems to amount to "as this most recent SST shows, there’s a lot of cool water" which does not seem very rigorous to me. Will you come back after the La Nina passes and give us your considered opinion again? It will be mildly amusing.